Greensburg is a city in, and the county seat of, Kiowa County, Kansas, United States. As of the 2010 census, the city population was 777, and before the tornado, in 2000 the population was 1,544. In the evening of May 4, 2007, Greensburg was devastated by an EF5 tornado that traveled rapidly through the area, leveling at least 95 percent of the city and killing eleven people between the ages of 46 and 84. Greensburg today stands as a model "green town", often described as the greenest in America. The hospital, city hall, and school have all been built to the highest certification level issued by Leadership in Energy and Environmental Design (LEED). Greensburg is also home to the world's largest hand-dug well. For millennia, the Great Plains of North America were inhabited by nomadic Native Americans. The first settlement was made at Greensburg in 1885. Greensburg was named for D. R. "Cannonball" Green, who owned a stagecoach company and who helped to form the city. At 9:45 p.m. CDT on May 4, 2007, during a deadly tornado outbreak, Greensburg was hit by an EF5 tornado. The tornado was estimated to be 1.7 miles (2.7 km) in width — wider than the city itself — and traveled for nearly 22 miles (35 km). Ninety-five percent of the city was confirmed to be destroyed, with the other five percent being severely damaged. The National Weather Service estimated winds of the tornado to reach 205 mph (330 km/h). This was the first tornado to be rated EF5 since the update of the Fujita scale and the first "5" classification since May 3, 1999, when an F5 tornado ripped through Moore, Oklahoma, as part of the 1999 Oklahoma tornado outbreak. Tornado sirens sounded in the city twenty minutes before the tornado struck, and a tornado emergency was issued, which undoubtedly saved many lives. 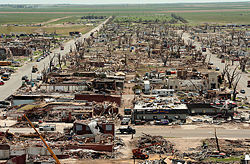 Kansas Governor Kathleen Sebelius and President George W. Bush both declared Kiowa County a disaster area, which opened up the affected areas for national and international aid. The tornado took 10 lives in Greensburg and two more in neighboring towns. While some rebuilding was done, the population by 2010 was about 50% of what it was in 2000, as the 2000 census found 1,574 residents, while only 777 were recorded in the 2010 census. After the tornado, the city council passed a resolution stating that all city buildings would be built to LEED — platinum standards, making it the first city in the nation to do so. Greensburg is rebuilding as a "green" town, with the help of Greensburg GreenTown, a non-profit organization created to help the residents learn about and implement the green living initiative. The city's power is supplied by ten 1.25 MW wind-turbines. Carbon offsets generated from the turbines are being managed by NativeEnergy, and have been purchased by charter supporters including Ben & Jerry's, Clif Bar, Green Mountain Coffee Roasters, and Stonyfield Farm. 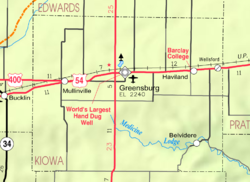 Greensburg is located at 37°36′10″N 99°17′33″W﻿ / ﻿37.6027963°N 99.2926131°W﻿ / 37.6027963; -99.2926131 (37.6027963, -99.2926131). According to the United States Census Bureau, the city has a total area of 1.48 square miles (3.83 km2), all land. The climate in this area is characterized by hot, humid summers and generally mild to cool winters. According to the Köppen Climate Classification system, Greensburg has a humid subtropical climate, abbreviated "CFA" on climate maps. As of the census of 2010, there were 777 people, 355 households, and 212 families residing in the city. The population density was 525.0 inhabitants per square mile (202.7/km2). There were 431 housing units at an average density of 291.2 per square mile (112.4/km2). The racial makeup of the city was 95.5% White, 0.4% African American, 1.0% Native American, 0.4% Asian, 1.4% from other races, and 1.3% from two or more races. Hispanic or Latino of any race were 3.9% of the population. There were 355 households of which 24.8% had children under the age of 18 living with them, 48.2% were married couples living together, 8.2% had a female householder with no husband present, 3.4% had a male householder with no wife present, and 40.3% were non-families. 36.9% of all households were made up of individuals and 16.3% had someone living alone who was 65 years of age or older. The average household size was 2.18 and the average family size was 2.83. The median age in the city was 45.2 years. 22% of residents were under the age of 18; 5.2% were between the ages of 18 and 24; 22.6% were from 25 to 44; 27.9% were from 45 to 64; and 22.3% were 65 years of age or older. The gender makeup of the city was 47.4% male and 52.6% female. As of the census of 2000, there were 1,574 people, 730 households, and 453 families residing in the city. The population density was 1,055.9 people per square mile (407.9/km2). There were 887 housing units at an average density of 595.0 per square mile (229.8/km2). The racial makeup of the city was 97.01% White, 0.83% Native American, 0.06% Asian, 1.02% from other races, and 1.08% from two or more races. Hispanic or Latino of any race were 1.59% of the population. There were 730 households out of which 23.8% had children under the age of 18 living with them, 53.3% were married couples living together, 6.2% had a female householder with no husband present, and 37.9% were non-families. 35.9% of all households were made up of individuals and 19.9% had someone living alone who was 65 years of age or older. The average household size was 2.14 and the average family size was 2.76. In the city, the population was spread out with 21.5% under the age of 18, 6.5% from 18 to 24, 20.5% from 25 to 44, 25.2% from 45 to 64, and 26.4% who were 65 years of age or older. The median age was 46 years. For every 100 females, there were 91.0 males. For every 100 females age 18 and over, there were 88.1 males. The median income for a household in the city was $28,438, and the median income for a family was $39,188. Males had a median income of $28,426 versus $20,875 for females. The per capita income for the city was $18,054. About 8.4% of families and 12.4% of the population were below the poverty line, including 16.6% of those under age 18 and 8.0% of those age 65 or over. Greensburg is served by USD 422 Kiowa County Schools. The Kiowa County High School mascot is Mavericks. Greensburg schools were closed through school unification. The Greensburg Rangers won the Kansas State High School boys class B basketball championship in 1948. Greensburg is home to the world's largest hand dug well. Work had begun on the well in 1887 to provide water for the steam engines of the Atchison, Topeka and Santa Fe Railway and Chicago, Rock Island and Pacific Railroad. When the well was completed in 1888 it was 109 feet (33 m) deep and 32 feet (9.8 m) in diameter. The well was used as the city's water supply until 1932. In 1939 it was opened as a tourist attraction allowing visitors to descend to the bottom of the well. The adjacent museum displayed a 1000-pound pallasite meteorite until the museum fell down around the meteorite during a 2007 tornado that destroyed the city. The Well was not destroyed, and the meteorite was found in the rubble of the museum and moved to a temporary home in Hays before Greensburg could reclaim it. 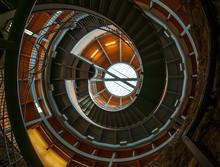 In May 2012, the new Big Well Museum and Visitor Information Center opened featuring exhibits about the history of Greensburg, The Big Well, the 2007 tornado, rebuilding and Space Wanderer Pallasite Meteorite. On October 16, 2006, a related smaller meteorite measuring 154 pounds (70 kilograms) was dug up near Greensburg (5 miles (8.0 km)) and Haviland (4 miles (6.4 km)). The only scientific publication discussing time of impact suggests a terrestrial age of 20,000 years. It was once thought that its age was closer to 10,000 years. The town serves as a time station for the annual Race Across America, a 3,000 miles (4,800 km) transcontinental bicycle race. US-54 / US-400, US-183. Bus service is provided daily eastward towards Wichita, Kansas and westward towards Pueblo, Colorado by BeeLine Express (subcontractor of Greyhound Lines). Several television networks have drawn an interest in Greensburg as a subject for reality shows as a result of the Greensburg City Council's decision to make the city a "green" town. A documentary on its reconstruction, called Greensburg, aired on Planet Green, a sister network of Discovery Channel. Another documentary, Earth 2100, drew attention to Greensburg as "the green town" that was built after the devastating 2007 tornado. The ABC film suggested a fictionalized, future Greensburg as a model showing how American towns can successfully implement green technology, and become a beacon for hope on a planet doomed to destruction from climate change and overpopulation. Marine One, carrying President George W. Bush, flies over Greensburg after the destructive tornado. The S.D. Robinett Building, the only historic building in downtown Greensburg to survive the tornado. Greensburg's arts center, constructed after the tornado to environmentally stringent LEED Platinum standards. The facility integrates its own solar panels and wind generators for energy self-sufficiency. Renovated Kiowa County courthouse in 2009. Rebuilt Big Well in 2013. "World's Largest Pallasite Meteorite", now stored in the rebuilt Big Well Museum. ^ a b c d e f Geographic Names Information System (GNIS) details for Greensburg, Kansas; United States Geological Survey (USGS); October 13, 1978. ^ a b "2010 City Population and Housing Occupancy Status". U.S. Census Bureau. Archived from the original on July 21, 2011. Retrieved March 6, 2011. ^ "Tornado was an EF-5; FEMA's help expected". The Wichita Eagle. 2007-05-06. Archived from the original on 2007-05-09. Retrieved 2007-05-06. ^ "Police Officer Injured In Tornado Dies". KAKE-TV. 2007-05-09. Archived from the original on 2007-09-28. Retrieved 2007-09-25. ^ Blackmar, Frank Wilson (1912). Kansas: A Cyclopedia of State History, Embracing Events, Institutions, Industries, Counties, Cities, Towns, Prominent Persons, Etc. Standard Publishing Company. p. 792. ^ History of Greensburg, KS Archived 2008-10-02 at the Wayback Machine, Blue Skyways, 2006-05-18. Accessed 2008-05-07. ^ "On the Road — Tornado Alley". Santa Barbara Independent. Retrieved 2008-05-27. ^ NOAA Satellite and Information Service. "Event Record Details". Archived from the original on 2008-05-03. Retrieved 2007-04-12. ^ KAKE-TV. "President Bush Declares Disaster in Kansas". Archived from the original on 2007-06-13. Retrieved 2007-05-06. ^ "Man Dies Months After Kansas Tornado Hit". U.S.A. Today. 2007-09-24. Retrieved 2017-01-31. 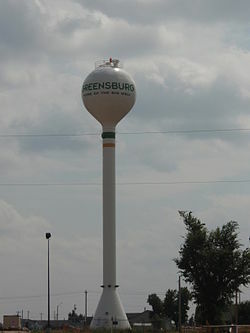 ^ "Greensburg GreenTown". Archived from the original on 2008-05-09. Retrieved 2008-05-04. ^ Fox, Thomas J. (2013). Green Town USA: The Handbook for America's Sustainable Future. Hatherleigh Press. ISBN 1578263123. ^ "Greensburg Wind Farm". Archived from the original on 2010-03-16. Retrieved 2009-11-30. ^ United States Census Bureau. "Census of Population and Housing". Archived from the original on May 12, 2015. Retrieved September 12, 2014. ^ "USD 422". USD 422. Retrieved 5 January 2017. ^ "Greensburg Still Leads", The Hutchinson News, 1 February 1949, p.20. ^ "Greensburg Meteorite Recovered". Archived from the original on 2007-09-28. Retrieved 2007-05-07. ^ "Greensburg Tornado: Greensburg's famed meteorite found under rubble". Archived from the original on 2007-05-09. Retrieved 2007-05-07. ^ Honda, M.; Caffee, M. W.; Miura, Y. N.; Nagai, H.; Nagao, K.; Nishiizumi, K. Meteoritics & Planetary Science, 37:12, 1711-1728. ^ "Unusual meteorite found in Kansas". Archived from the original on 2006-10-23. Retrieved 2006-10-17. ^ Rand McNally. The Road Atlas '08. Chicago: Rand McNally, 2008, p. 40. Wikimedia Commons has media related to Greensburg, Kansas.